When I post about a new finish I usually say, she's finally finished! Quilts always take a lot of time and energy. It always feels good to complete them, enjoy them and check them off your list. But let me say this time - shes. finally. finished. that I started in November? I posted about it HERE. and I thought I might as well kill two birds with one stone and make it as a sample for the store. We made kits up and we thought it would be a nice way to showcase 30's prints, as well as, something Springy for the store. Once I begun, I realized that it wasn't quite what I originally thought it was. I've mentioned that I'm kind of spontaneous and a lot of times I just dive right into a project, right? Well, if I would have looked a little closer at the details and instructions of this quilt, I would have realized that this quilt is small. Like 37-ish inches small. Total. 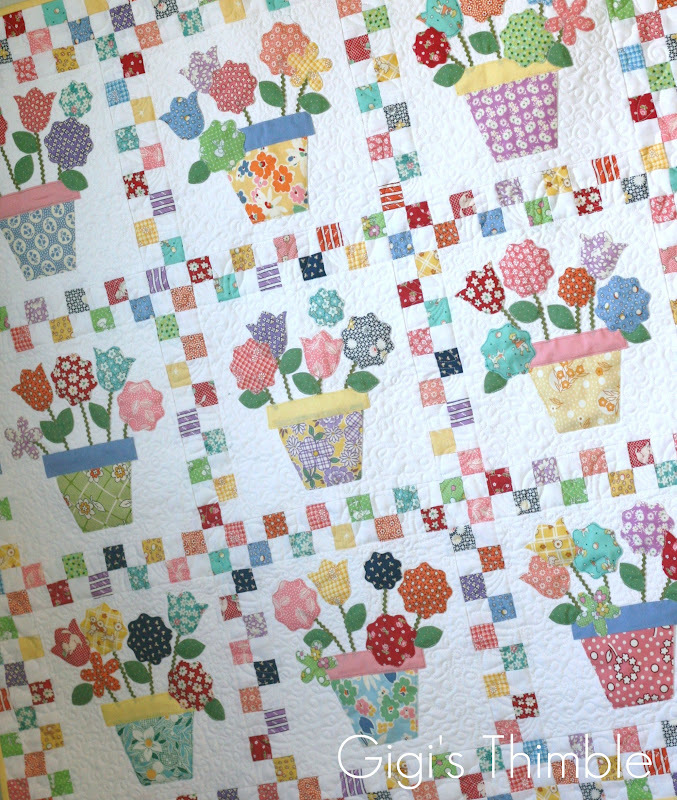 The photo of it in the book [Sugar Sack Quilts by Glenna Hailey] was kind of deceiving to my eye. Everything looked bigger than it really was. I assumed that the checkerboard border was probably 2-1/2" squares [finishing at 2"] with some decent size flowers. I was excited for this little hand applique project. Well, little was right. Most of the flowers were about 2" in diameter and the sashing squares finished at 1". Cute. But definitely smaller. I had to switch gears. And that took me some time. For a month or so, I stewed over what method of applique to do. I didn't think I had time to hand applique it. It was a sample for the store so I needed to whip it out. Plus, with all of the little curves and crevices of the flowers, I knew it would be a beast. I went back and forth. I could feel myself putting this off in my mind. Dreading it. In fact, I was OVER it and kind of regretted suggesting to make it. I definitely had a million other projects to do and decided I didn't want to deal with this one. But I knew I had to get going. So, following the authors instructions, I decided to used the Heat n Bond method. But, instead of hand stitching around each piece per her instructions I decided to just machine applique them on with a straight stitch. * Read the small print on any project you're about to start. * Don't take on more than you can handle - no matter how darling you think it is. Wow, beautiful quilt! Must feel great to have it finished. Stunning, love the vintage looking fabrics and pattern. Amazing. I love it. Thank you for the wise advice. I'll take it in consideration. Great Work. SUPER cute! I'd love to make one similar! Congrats on finishing, it's perfect! Way to go Amber! You have some real staying power. That probably would have done me in! Love the checkerboard! 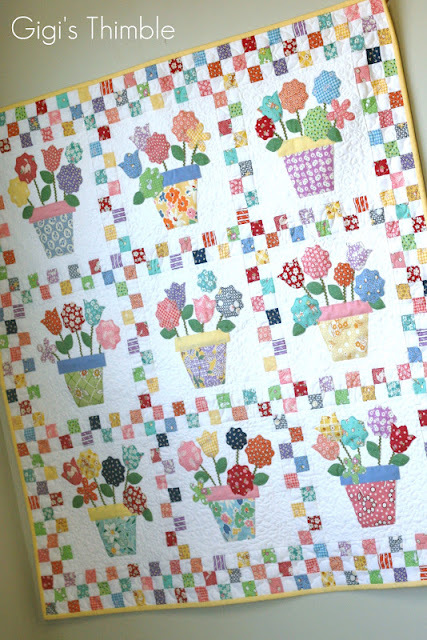 This is such a pretty Spring quilt! Well done for persevering! I hate when instructions aren't clear and just guess a few measurements! I think it turned out great. I have forgotten to read the dimensions written on a pattern before and then was shocked that the quilt didn't turn out the way I thought. Darling little quilt. I love your "words of wisdom" at the end of the post. I should probably print those out and hang them up somewhere! lol. It's a beautiful quilt and I love your lessons learned! This quilt doesn't look small in your photos either. Well it is adorable and I love the ricrac stems - easier than the usual bias binding ones! Fab job and you can do it! Are you doing the bigger version or is that it ticked off the list? It's beautiful - Well Done! So amazing and sew much work! That quilt is just way too cute! I'm thinking I need to hunt down that book, but I would like to make it bigger too, although it is amazing at any size! I just love everything about yours - well done!